Queen Maggie and her lady-in-waiting Pie come from the Magpie Court to local fairy festivals in search of shiny things. 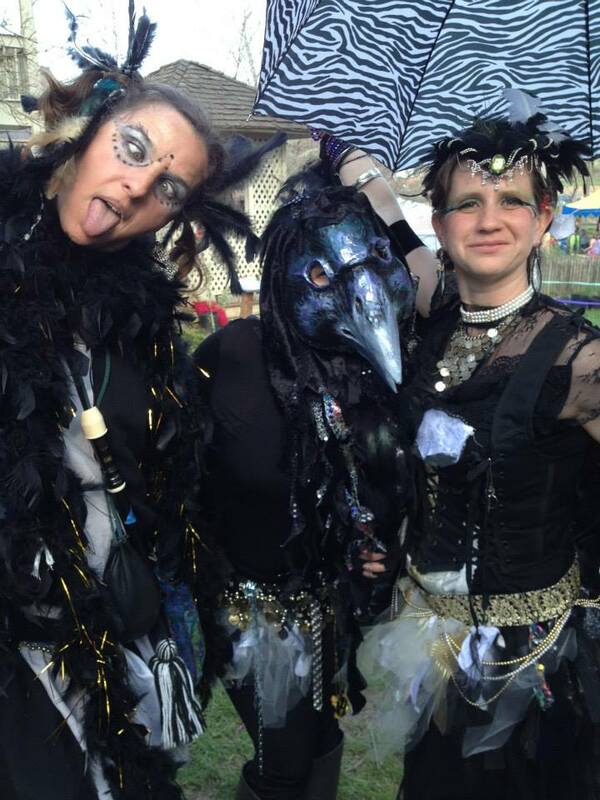 The two magpies (Queen Maggie in human form, Pie masked in bird form) stroll the festival grounds, asking for donations of shiny things for their court/nests, inducting friends into the Magpie Court, and offering impromptu readings, dances, and songs about magpies and other corvids, all while interacting with festival guests, performers, and vendors. Maggie & Pie are light-hearted tricksters, and might try to build a nest of shiny things in the Dark Fairie Realm, “steal” shiny things (with permission, of course) from “unsuspecting” persons or fairies, get distracted by recognizing themselves in mirrors, or generally make people smile with a bit of mischief. They are also sometimes accompanied by their court jester and herald Squelch (Illya Gemsdottir) and other Corvid friends including Bone, Cake, and Hugh. Maggie and Pie visited the Maryland Faerie Festival in 2013, 2014, and 2015, and the Spoutwood Faerie Festival in 2014 and 2015, where they delighted participants of all ages. Baba Ghanoush (Amy Fae and Joanna Alizarin), the duo behind the Magpie Court, have over 3 years of experience working and dancing together as a duet, plus solo experience and working with their dance troupe Aubergine (directed by Nina Amaya). Besides Maggie and Pie, they have played a cast of other characters including Krampus, a Christmas sprite, faeries, mermaids, and pink fluffy unicorns. Baba Ghanoush would love to fly to your birthday party, children’s (children of ALL ages, of course, even the adult ones!) event, or fairy festival in the form of the Magpie Court, beautiful fairies, or other whimsical creatures of legend and lore.